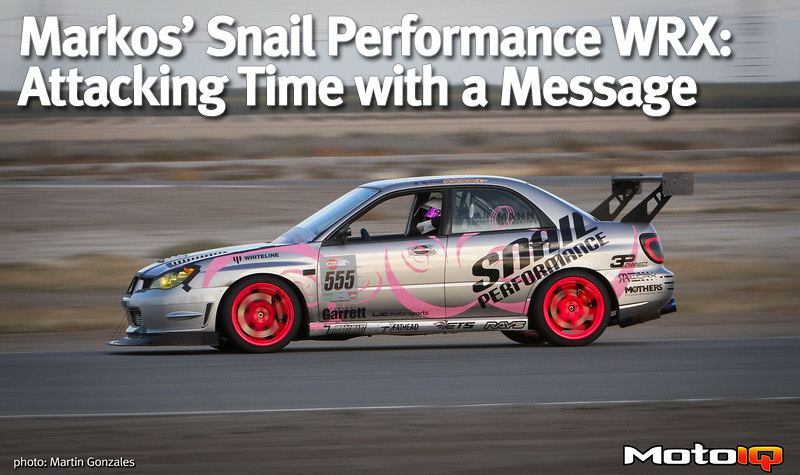 Those of you following Time Attack in the US and also know Subarus know of Snail Performance. We covered the Snail Performance STI hatchback of Taylor Wilson a few years back. This particular car has been in the Snail Performance family from the very beginning, belonging to the wife of Travis Barnes. Markos purchased the car in 2011. Staying within the family, Taylor Wilson did the design and AZ Auto Graphics made it a reality. The message conveyed by the design and the appearance of the car is to promote breast cancer awareness. What I really like about this car? It was built in a similar manner to the SHOWKAR. It was built with a smart selection of bolt-on parts that work well in harmony together. It’s a build anyone can replicate. And, it’s fast…. Very fast. At the first round of the 2017 Global Time Attack season at Streets of Willow, Markos took first in the Street AWD category with a time of 1:20.637, beating out the next car by 2.1 seconds. That’s not the most impressive part, however. The only cars to go faster were two heavily built GT-Rs (1.18:717-Unlimited AWD and 1:19.45-Limited AWD) and the Ariel Atom with the engine build we featured (1:19.6). The engine is a pretty mild build, focused on addressing the weaknesses of the EJ257. The rods were upgraded to Manley H-beam rods, ARP head studs and that’s about it. The cams and valvetrain are all stock. 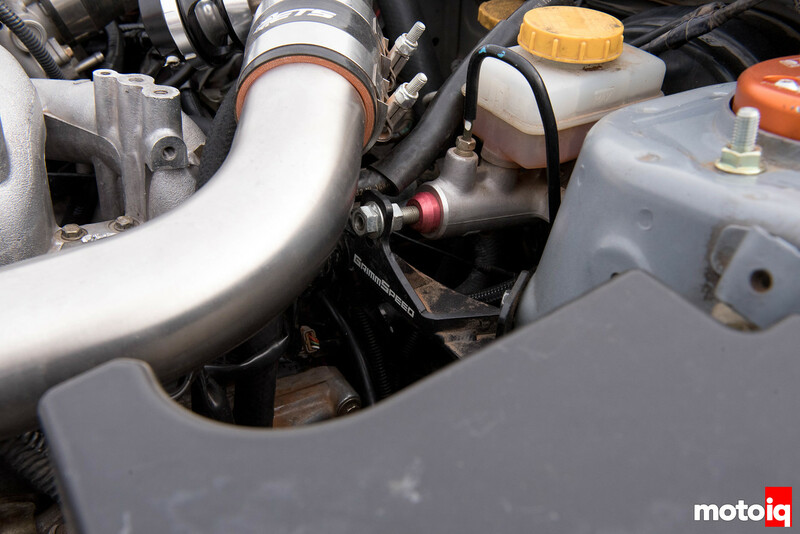 On the top of the engine, IAG TGVs are paired with 5mm phenolic spacers to improve flow and reduce heat transfer to the charge air in the stock intake manifold. Cusco motor mounts and transmission mounts reduce movement to reduce slop and create a more responsive package to throttle inputs. An ETS rotated mount turbo kit and intercooler are paired with a Tomei equal length header. A Honeywell Garrett GTX3076R turbo with v-band turbine housing provides the boost. The GTX turbo features a CFD tuned forged billet compressor wheel for optimal aerodynamic efficiency. CFD allows the wheel aerodynamics to be optimized in the design process. Using a forged billet to make the wheel allows for thinner, strong and more aerodynamic blades with a smaller hub section for better flow. The GTX turbo also uses a floating ball bearing center section. The ball bearings improve spool and handle rotational and thrust loads better. The floating bearing cartridge damps out high order vibrations which helps longevity. The compact and low profile Turbosmart Hyper-Gate 45 external wastegate regulates the boost. A turbine housing blanket keeps the heat in the turbine housing and minimizes heat getting into everything else near it. The lines and hoses closest to the turbo are still wrapped in insulation for protection. A Turbosmart Race Port BOV handles the charge air venting duties on shifts. Brake master cylinders in street cars are often mounted to the sheet metal firewall, separating the engine bay and passenger compartment. This sheet metal can flex, which reduces braking responsiveness. This Grimmspeed brace helps to reduce the movement of the master cylinder, improving brake feel.